The Indo-European languages are a very large family of related tongues spoken widely in the Americas, Europe, and Western and Southern Asia. Whereas Spanish, French, Portuguese, Romanian, and Italian are all descended from Latin and are known together as the “Romance languages,” today’s Indo-European languages (Anatolian, Indo-Iranian, Greek, Italic, Celtic, Germanic, Armenian, Tocharian, Balto-Slavic, and Albanian) are all believed to have derived from Proto-Indo-European, a hypothetical language no longer in existence. Research indicates that the earliest speakers of this language originally lived around Ukraine and neighboring regions in the Caucasus and Southern Russia, spreading later to most of the rest of Europe and down into India. The earliest possible end of Proto-Indo-European (PIE) linguistic unity is thought to be around 3400 BCE. The speakers of this PIE language did not develop a writing system, which means we have no physical evidence of how it looked or sounded. Linguists have been trying to reconstruct it using several different methods; while an accurate reconstruction of it seems impossible, we have gained some general knowledge of what PIE speakers had in common, both linguistically and culturally, from studies based on the comparison of myths, laws, and social institutions. This branch of languages was found in the Asian portion of Turkey and some regions of northern Syria, and the most famous of the languages is Hittite, with Luvian, Palaic, Lycian, and Lydian being some other examples. In 1906, archaeologists discovered a large cache of Hittite material in Hattusas, which had been the capital of the Hittite Kingdom. There, in the remains of a royal archive, researchers found about 10,000 cuneiform tablets and various other fragments that cold be translated. The texts date back to the mid- to late second millennium BCE. All languages of this branch are currently extinct, but it is here we find the oldest surviving evidence of an Indo-European language, dated about 1800 BCE. This branch includes two sub-branches: Indic and Iranian. Today these languages are spoken in India, Pakistan, and Iran, as well as in areas from the Black Sea to western China. Sanskrit, which belongs to the Indic sub-branch, is the best known among the early languages of this branch of PIE. The oldest variety, known as Vedic Sanskrit, has been preserved in the Vedas, a collection of hymns and other religious texts from ancient India. Indic speakers came to the Indian subcontinent from central Asia around 1500 BCE. Hymn 1.131 of the Rig-Veda tells of a legendary journey, and it may be a recollection of a distant memory from that migration. Avestan belongs to the Iranian sub-group. Old Avestan (also known as Gathic Avestan), the oldest preserved language of this sub-branch is the “sister” of Sanskrit, and it is the language used in the early Zoroastrian religious texts. Another important language of this sub-branch is Old Persian, found in the royal inscriptions of the Achaemenid dynasty starting in the late 6th century BCE. The earliest confirmed evidence of this branch dates back to about 1300 BCE. The Indic and Iranian sub-branches have survived until today. Many Indic languages, such as Hindi-Urdu, Punjabi, and Bengali, are spoken in India and Pakistan. Iranian languages, such as Farsi (modern Persian), Pashto, and Kurdish, are spoken in Iraq, Iran, Afghanistan, and Tajikistan. The Phoenician script, which is a direct descendant of the Proto-Sinaitic script, is an important “trunk” in the alphabet tree – many modern scripts can be traced through it. Arabic, Hebrew, Latin, and Greek scripts are all descended from the Phoenician. It was a “consonantal alphabet” meaning that it only contained letters representing consonants (vowels were generally omitted), and it was written from right to left. The major change between Proto-Sinaitic and Phoenician is graphical – the Phoenician letter shapes became more linear and abstract, while the Proto-Sinaitic letters were more “pictographic.” It appears that Phoenician language, culture, and writing were all strongly influenced by Egypt (which controlled Phoenicia for a long time). Our knowledge of the Phoenician language’s development is based on the few written texts we have found. Before about 1000 BCE, Phoenician was written using cuneiform symbols that were like the ones the Sumerians used and that were common across Mesopotamia. The first signs of the Phoenician alphabet as a separate entity, however, were found at Byblos, and they are clearly derived from Egyptian hieroglyphics, not from cuneiform. The 22 Phoenician letters are simplified Egyptian hieroglyphic symbols, and they became standardized at the end of the 12th century BCE. By 1000 BCE, the Phoenician and Hebrew languages had become distinct from Aramaic, which was spoken in Canaan. Because it used an alphabet, the Phoenician writing system was simple and easy to learn, as well as being very adaptable to other languages. That made it quite distinct from cuneiform or hieroglyphics. In the 9th century BCE the Aramaeans adopted the Phoenician alphabet, adding in symbols for the initial “aleph” and for long vowel sounds; this Aramaic alphabet eventually turned into modern Arabic. By the 8th century BCE, texts written in the Phoenician alphabet but whose authors were most likely not Phoenician showed up in Cilicia in southern Asia Minor and in northern Syria. 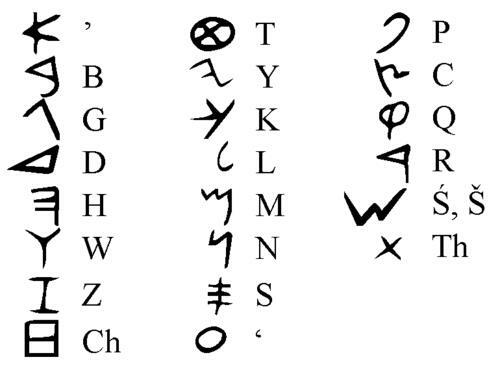 Eventually the Greeks, who were close traders with these societies, adopted the Phoenician alphabet, added additional vowel sounds, and thus created the Greek alphabet (upon which our modern Latin alphabet is based). We will discuss the Greek and Latin alphabets in Part 2 of our discussion of the Indo-European languages.